After you have all the partitioning done, it’s time to create your RAID(s). 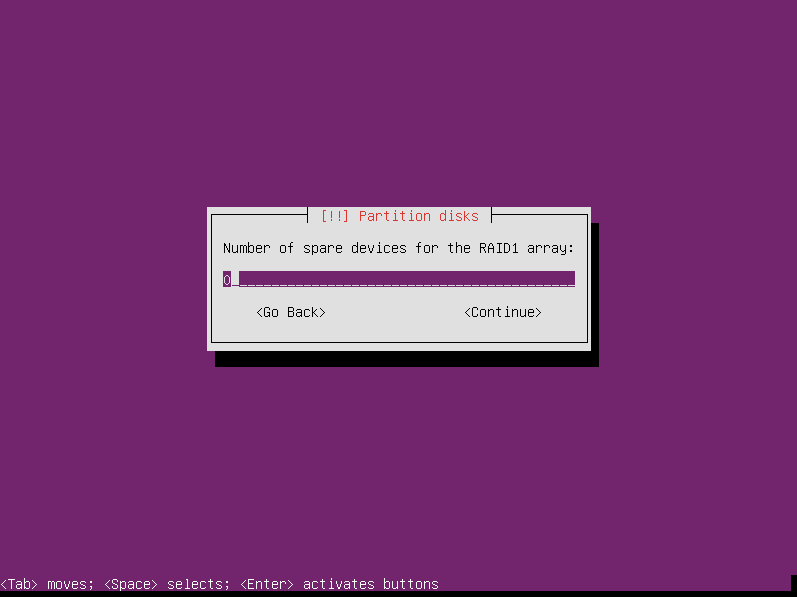 This tutorial shows how to create two separate arrays: one for the /boot partition and one for everything else. Since we’re using LVM, it’s possible to use only one array. It’s only required to have a separate array if you are using LVM inside of LUKS containers — which we aren’t. 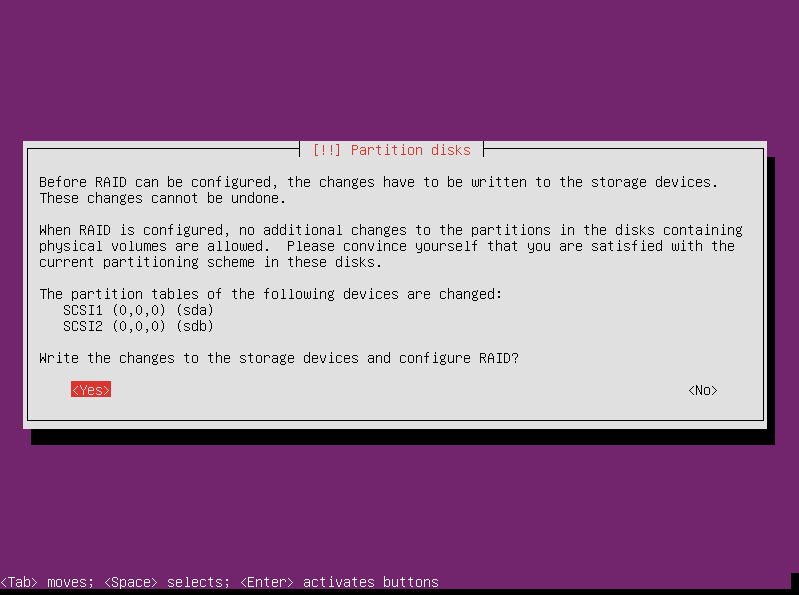 You can’t change the partitions after RAID is configured, so the partitioner wants to confirm that you are satisfied with the changes you have made to the disk partitions. If so, select yes. RAID0 doesn’t offer any redundancy, and therefore no data protection in case of a drive failure, so that’s a bad option for our purposes. Select RAID1 and press enter to continue. Enter how many active devices you want in the array. We only have two in this computer, so the installer defaults to two. Next you enter how many spare devices you want in the array. Again, we only have two devices in this computer, so we have to leave it at 0. If you have more drives available you can keep some as spares. Then when a drive dies, a spare can quickly be activated to replace it. The next screen asks you which devices to put in this array. It doesn’t matter if you choose to make your /boot array first or second. For this tutorial, I made it first. 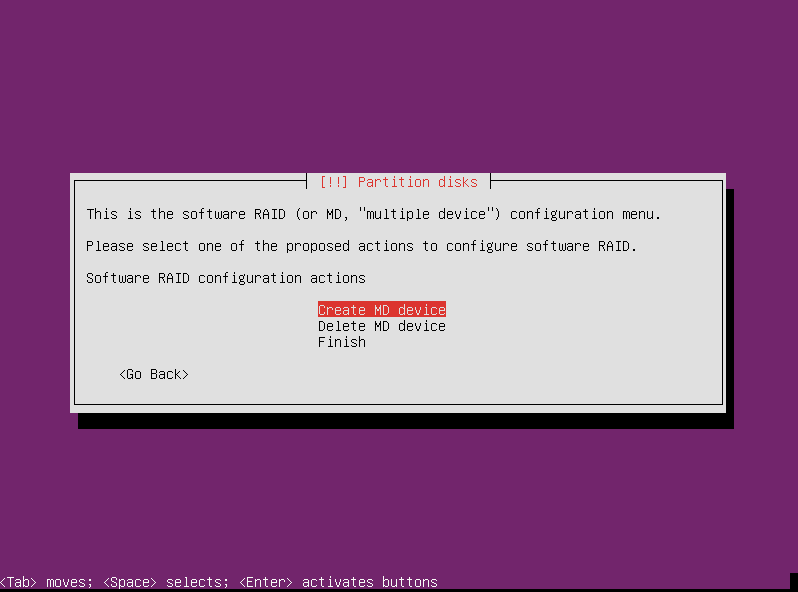 Now with the new installers the bootable flag cannot be set to on for the raid partitions which means you cannot configure raid 🙁 Moreover the boot now is by default set to EFIboot which complicates things even better. The combination of raid 1 and lvm is critical for professional environments. This is a great tutorial. Could you update it? That would be awesome. Thanks! Thank you — this was extremely helpful!! Hey, Jonathan! Glad to hear it helped. Great tutorial. Thanks for taking the time to do this. Thanks, Gary. Glad to help. I am having a problem with this setup. If I unplug either drive, the system will not boot. I get the error message: “Begin: Waiting for encrypted source device……”. So far I have not been able to find any help on what the solution to this is. I then rebuilt with RAID->LUKS->LVM rather than RAID->LVM->LUKS but get exactly the same problem. Lst time I tried this (in 2010) the same problem cropped up. I really don’t think Ubuntu has paid much attention to the need for encrypted RAID to work. I even tried putting a clean disk in place of the “removed” disk to see if it rebuilt, but still says just “waiting for encrypted source device”. I gave up on Ubuntu for this. Instead I installed a minimal version of Debian 6.0.10 and the encrypted RAID works perfectly; that is removing either drive still allows you to enter your passphrase and log in. Seems to me there is no point using Ubuntu for encryption with RAID if you can’t boot when a drive fails. And since I am about to build a HP microserver for file storage, I do not want to get burnt by a buggy RAID/Encryption setup. Thanks “the new guy” for the detailed instructions though, they are probably applicable to Debian and maybe other OS’s too. I also have “The new installer”, downloaded today and the bugs that George Pligor speaks of are also preventing me from being able to configure a software RAID 1 array on Ubuntu 12.04.3 LTS 64-bit Server. Not being given a choice to make a partition Primary or Logical. The inability to set the Bootable Flag to “on”. The bootable flag of course is the killer. It means grub will not instal. I am unsure why they changed the installer, but I really wish they hadn’t. I would really like to get my hands on the old installer because the new installer doesn’t recognize a hardware RAID1 array setup in the Intel RAID Utility on my Gigabyte Z87M-D3HP Motherboard either. turns out the problem was that I was using 3TB HDDs. anything bigger the 2TB and the Partition table needs to be forced to GPT. The current installer is not able to cope with rives larger than 2TB for RAID. explicitly set the Partition table to GPT. exit and begin normal instal. 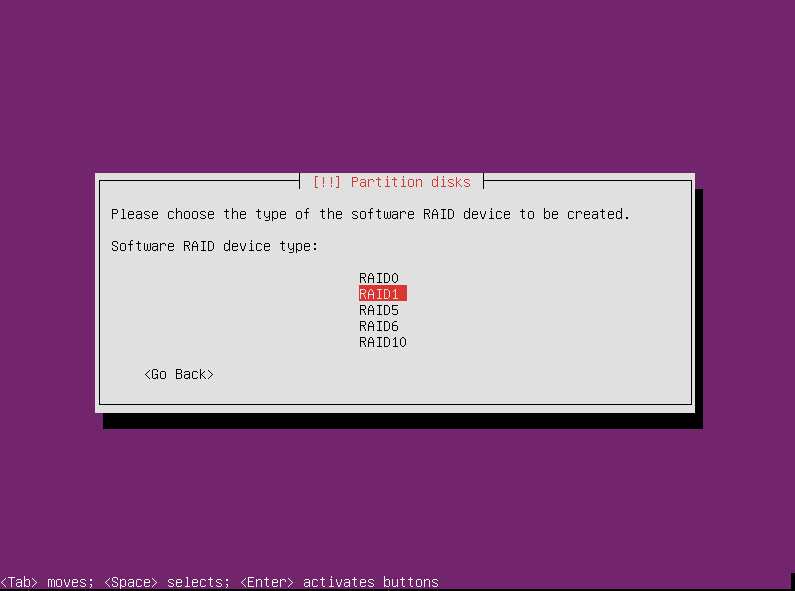 Once you get to the Partitioner, the partitions are already setup, just do the RAID Configuration. not need to worry about setting bootable flag. Finish and write changes to disk. This is only for HDDs above 2TB that this is necessary. Thanks for your input, Alan. Those bigger drives pose some interesting challenges. This guide was great – thanks for taking the time to prepare! Thanks for the effort , the tutorial is clear and very helpful. I have a question, need advise / help. With the same setup like the example with a RAID 1 with 2 drives setup , if one of drive is dead and what steps to recover the array after a brand new unformatted hard drive is replaced . There be any problems with an encrypted partition by adding another PV in LVM? Could you describe the process more? This is extremely helpful and easy to follow! Is not /home missing in this tutorial or is it created automatically within / ? Awesome tutorial! Thanks a lot! Is Websense Filtering My Internet Traffic?